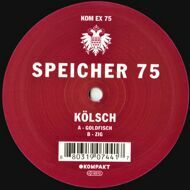 For SPEICHER 75, label staple and world-venerated club juggernaut KÖLSCH returns to the series with two expectedly masterful epics for the discerning floor. We’re quite used to the sight of even the most composed of crowds going strictly mental when Denmark’s Rune Reilly KÖLSCH drops another one of his anthemic cuts during a live performance – just think of timeless masterpieces like the hallucinogenic LORELEY (KOMPAKT EXTRA 68), the slightly nutty OPA (KOMPAKT EXTRA 70) or the sumptuous ALL THAT MATTERS (FMX/ATM 001): with literally every single one of his tracks being a wildly popular DJ choice, the man behind the chartbusters certainly knows how to create an impact. It’s those highly emotive yet unimpeachably simple leads we love so much with KÖLSCH, and we’re more than delighted to find them again in GOLDFISCH, a deliriously beautiful track full of shimmering pads and cinemascopic chords. A soaring trip to the eye of the storm, this will enchant hopers and mopers alike, making it the perfect primer for ZIG, the B-side’s majestic prime time mover. Here, you’ll find fizzy percussion and spanking disco riddims leading your way to melodic bliss, fleshing out a unique vista on a mythical place where the melancholic and the ecstatic meet as friends.